The Brown 6G3 Amp Kit! Our newest amp kit from Leo's Brown era!!! The bridge between the Tweed and Black ears. This is a great sounding 15 Watt 2 Channel amp with awesome Leo Tremolo!!! 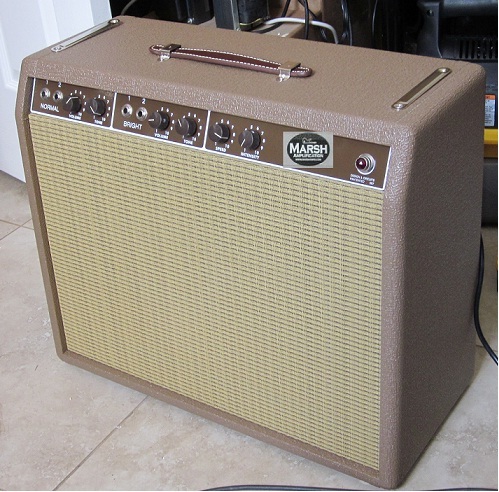 Great looking with the classic Rough Brown Tolex and Wheat Grill of the early 60's!!! All high quality components provided! Orange Drop caps, Cloth Wire, Heyboer US Transformers, TAD, MEIC or Sprague Caps!!! Stock Speaker is a Jensen C12Q! This kit is offered as an EXPERT model Kit only! No instructions provided. Schematic and Layout Diagrams only! We are happy to provide email support as well.